Through outreach programs, Gentle Barn fosters kindness, compassion and confidence in abused children by bringing them to visit the sanctuary and hear the animals’ stories. While conditions at places like E6 Cattle are exceptionally cruel, animal protection groups have long pointed out that even usual legal practices within the animal agriculture industry are abusive. Roy, Ari, Mercy and Bob are lucky survivors of the E6 Cattle Ranch in Hart, Texas. 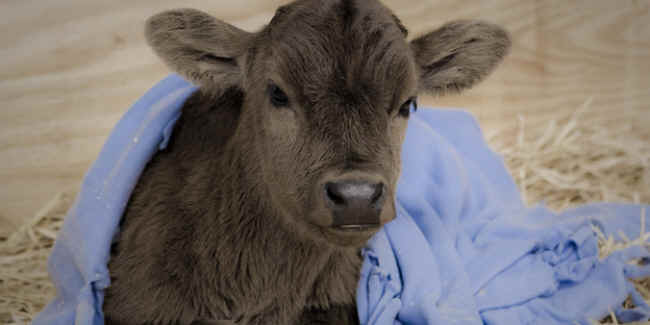 A new uplifting film from animal protection group Mercy for Animals tells the story of their rescue when an uncover investigator purchased the weeks-old calves for $10 each. With little economic value to the E6 ranch—a family-owned business that supplies animals to the dairy industry—the calves were denied veterinary care or medical treatment. An earlier investigation of E6 Cattle had revealed workers bashing in the skulls of calves with pickaxes and leaving sick calves to die in filthy crates. The four rescued calves have found a new home at The Gentle Barn, a non-profit organization that rehabilitates abused farm animals and provides them with lifelong care. Through outreach programs, Gentle Barn also fosters kindness, compassion and confidence in abused children by bringing them to visit the sanctuary and hear the animals’ stories. While conditions at places like E6 Cattle are exceptionally cruel, animal protection groups have long pointed out that even usual legal practices within the animal agriculture industry are abusive. The close connection between the dairy and veal industries means that newborn calves are taken from their mothers within hours of birth and loaded onto trucks to be immediately slaughtered for bob veal, or confined to lonely, dark crates to be raised for milk-fed veal.